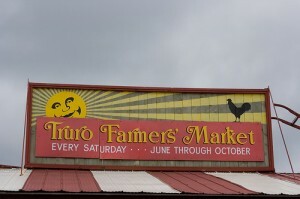 The Truro farmers market - a nice place to go on summer Saturdays. Truro is nicknamed ‘the Hub of Nova Scotia’ because it’s right in the middle of the province and at the junction of two major highways. It’s one of Nova Scotia’s largest towns. You’re almost certain to pass through if you’re driving between Halifax and Amherst or New Glasgow. Truro isn’t exciting enough to warrant a special stop but it’s a good place for lunch if you’re going by. There’s a plethora of fast-food restaurants by the highway but if you have time to venture downtown, it’s worth trying the soups and sandwiches on offer at the Nova Scotian Emporium and Fireside Tearoom in the downtown core (880 Prince Street). Just a couple blocks away from the tearoom, near the train station, is Murphy’s (88 Esplanade Street) – serving up one of the best plates of fish ‘n’ chips anywhere in Canada. If you want a souvenir that’s truly Truro, go buy something from the outlet shop of the Stanfield’s Underwear factory. You can also have dinner or stay in the John Stanfield Inn & Fine Dining. It’s in a beautiful building that was once home to the Stanfield family. Truro is worth considering as a base for visiting nearby attractions like Five Islands, Parrsboro and Tatamagouche and taking in activities like tidalbore rafting. The choice of hotels and B&Bs is better here than in surrounding smaller communities. The only campground near Truro is Scotia Pine, in the nearby community of Hilden just south of town. They offer wireless internet and a swimming pool. To get there, take Exit 12 or 13 off Highway 102 (1911 Highway 2, 1-877-893-3666).